Apologies for my long silence, I get so caught up in the process of helping golfers get more enjoyment from their game through simple improvements, that I forget to share this with all of you! I will be complementing Louis' Monday newsletter with my section on (most!) Thursdays from now on. My goal is to mainly share as many of our success stories as possible with everyone, as well as keeping you informed of the latest from the range & studio and all that goes with this. In a nutshell, a "journey to more golfing enjoyment for you" section! In this insert I am writing about the ongoing success stories of one of my best clients and someone I look up to a lot, Prof Garrett Slattery; our professionals doing well; and start answering some of the questions that you responded to from my last insert; ending off with some general driving range information. Prof Garrett Slattery shines again! I think by now Garrett hardly needs any introduction anymore! 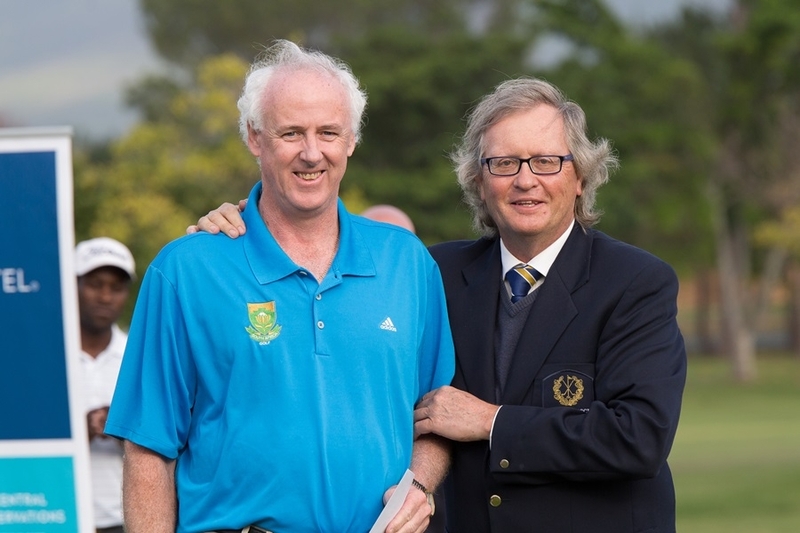 This visually impaired golfer and Stellenbosch Golf Club member happens to also be the number one ranked visually impaired golfer in South Africa. He has won numerous titles in SA and around the globe in his Division (B2) - by definition meaning that the maximum cut-off distance for such a person being able to see something (albeit not clearly! ), which we can ordinarily see at 60 meters, stands at only 2 meters! 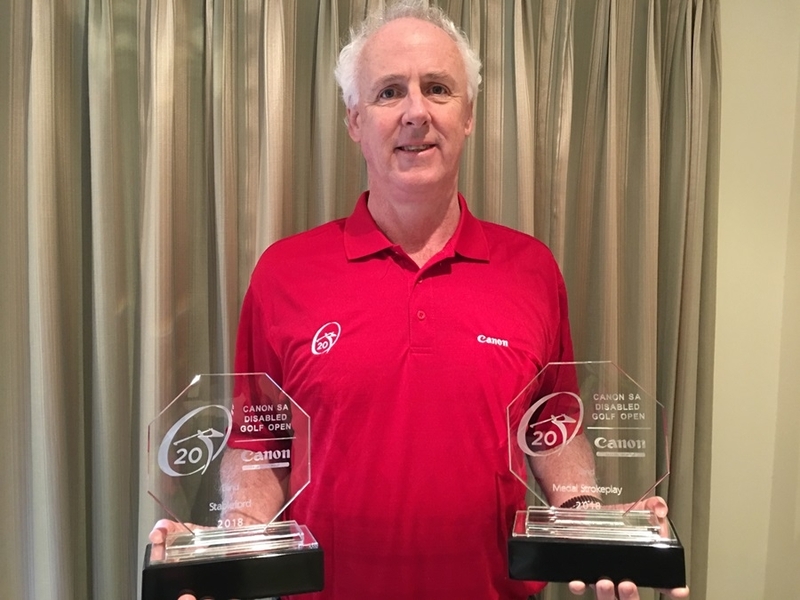 This is the year though in which he won a special one - a clean sweep of our Club Champs' C Division! Garrett carded no less than a gross 89 to take the C Division's gross, net and senior titles! What a great achievement this is for a disabled person and an inspirational story! I consider myself fortunate enough to be Garrett's coach. He is blessed with an incredible feel for the short game. As is well known, when one of a person's senses are weakened, his/her other senses become heightened, most certainly true in Garrett's case. I recall standing next to him outside the reception area once, when he mentioned that he heard his car's boot closing from the other side of the parking lot! He is also an excellent wine taster!! What has made a big difference lately though, is that on top of this strength, we have managed to improve his swing path, especially with the driver. It used to be a touch too much on the outside just before impact, which we have now reduced with the help of our FlightScope technology, and this has boosted Garrett's performance even further. So much so that he also managed to win blind medal, stableford and overall seniors titles (19+ handicaps) at the South African Disabled Golfers Championships two weeks ago at Magalies Park near Pretoria. Our Club's Pro's doing well! Before writing on, I have to just include a hearty congratulations once again to Stellenbosch Golf Club and Sunshine Tour member Justin Harding, for breaking into the top 160 ranked position in the world (157). This is great news! It was not too long ago that Justin was going through the motions on the FlightScope X3 in the studio (which we will be doing more of!) and I can certainly see what makes him such a naturally talented golfer. Next goal Justin - top 100! We are behind you all the way. Well done also to our two PGA Trainees, Pierre de Villiers and Johan du Buisson, for excelling at the Apprentice Championship held at Houghton Golf Club on Monday. They finished in 3rd and 8th position respectively in a field of 70 participants! On top of that they also learnt a lot at their residential courses. 1. What is happening at the range and how it is developing? 2. Playing tips and/or information about effective golf techniques. 3. How can you make the most of your practice sessions or warm-up routines? 4. Equipment technology and the latest trends in the world of technology/fittings and how it can benefit you. So to begin at the top with what is happening at the range: Well, a lot! Our goal is to transform it into one of the top on-course ranges in the country. By now you will have noticed these subtle transformations (other than the world-class studio!) that are going a long way and are making our range ever more popular. It will not be too long (especially after the good rainfall!) for the embankment at the back of the range to turn green, as well as the 5 strategically placed target greens. From the middle of the mat row, these greens are placed at 50 metres, 80 metres, 105 metres, 130 metres and 175 metres. We are aware that longer hitters still manage to send the ball over the back embankment, sometimes as far as the 16th teeing area, and therefore a further barrier will soon be set up on top of the embankment, which should reduce this ocurrance drastically. I think we may now also have found a winning solution to the teeing problem with the driver. Up until now people have been forced to move off the mats onto the grass in order for them to be able to tee up with the driver. This has led to us firstly losing a lot of grass while people move forward further and further, and more importantly, it is dangerous. The standard teeing options up to now were not ideal, as mainly the teeing height could not be adjusted effectively. Fortunately this is now a thing of the past thanks to the stepless height-adjustable tees. 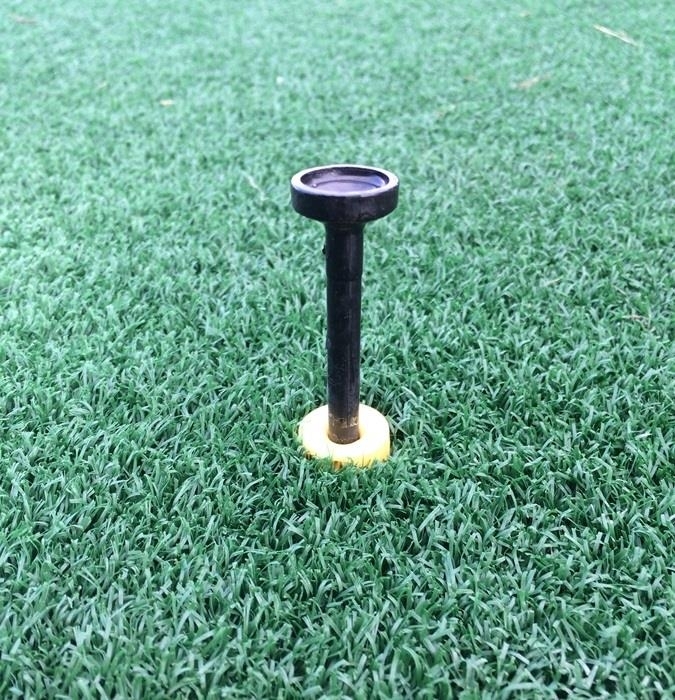 As the name obviously implies, these tees are adjustable from iron/hybrid height right through to a nice and high driver height as shown below. What's more is that they are fixed, feel just like a normal tee when striking the ball and will (hopefully!) last a relatively long time. 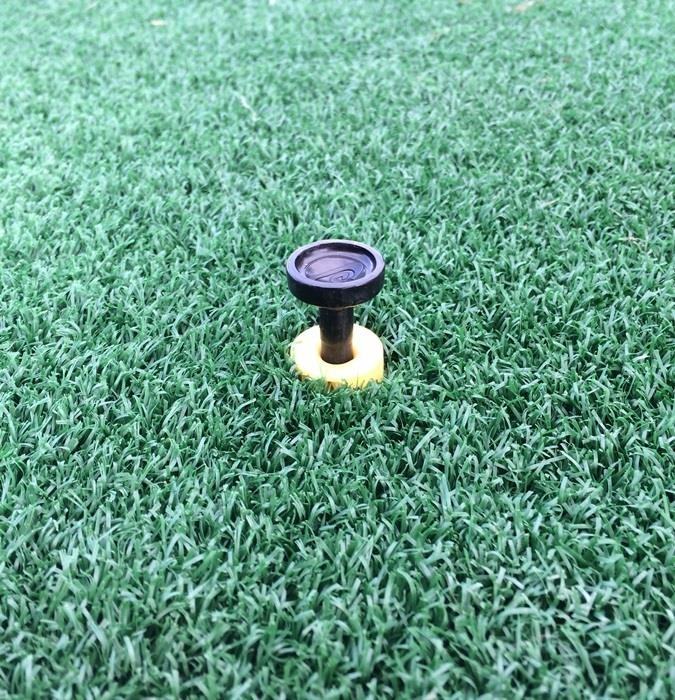 You will find these innovations on every mat when you go practice, so there is now no need anymore to go onto the precious grass and endanger yourself! So far it looks like a hit and I hope this increases your practice enjoyment further. With the winter light creeping in, the range hours are now also simplified: Opening: 08h00 and closing: 17h30. Note there is no longer a "last balls" time - instead, we will (also weather-dependant), provide you with the amount of balls you think you can realistically hit out up until 17h30 without feeling rushed, leaving enough daylight time for our ball collection. A 25-ball bucket is appropriate if you can only arrive a few minutes after 17h00 for example - we still want you to enjoy your session without feeling too rushed. If the weather does not play along we may at times have to close a bit earlier. Of course you are welcome to chip with your own balls until dark! On that note we have noticed more people asking for range balls to chip with, which sometimes looks more like half a bucket! As mentioned you are welcome to chip with your own balls, which is more appropriate in this case. Thank you for your support and there are many more success stories and more information coming over the next few weeks. Please don't hesitate to talk to me should you have questions about how you could enjoy your golf more!